Signal Processing Magazine The premier publication of the society. 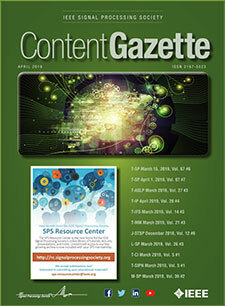 SPS Resource Center Online library of tutorials, lectures, and presentations. SigPort Online repository for reports, papers, and more. SPS Feed The latest news, events, and more from the world of Signal Processing. Distinguished Lectures Learn from experts in signal processing. Seasonal Schools For graduate students and early stage researchers. Event Calendar All events in a calendar view. Join SPS The IEEE Signal Processing Magazine, Conference, Discounts, Awards, Collaborations, and more! Job Submission Form Employers may submit opportunities in the area of Signal Processing. Jobs in Signal Processing: IEEE Job Site The IEEE Jobs site, find jobs in Signal Processing from around the world. SPS Directory* Directory of volunteers, society and division directory for Board & Committee Members. What Are the Benefits of Speech Recognition Technology? Can We Copy the Brain? Home » Can We Copy the Brain? Top Reasons to Join SPS Today! In the mid-1940s, a few brilliant people drew up the basic blueprints of the computer age. They conceived a general-purpose machine based on a processing unit made up of specialized subunits and registers, which operated on stored instructions and data. Later inventions—transistors, integrated circuits, solid-state memory—would supercharge this concept into the greatest tool ever created by humankind. So here we are, with machines that can churn through tens of quadrillions of operations per second. We have voice-recognition enabled assistants in our phones and homes. Computers routinely thrash us in our ancient games. And yet we still don’t have what we want: machines that can communicate easily with us, understand and anticipate our needs deeply and unerringly, and reliably navigate our world. Now, as Moore’s Law seems to be starting some sort of long goodbye, a couple of themes are dominating discussions of computing’s future. One centers on quantum computers and stupendous feats of decryption, genome analysis, and drug development. The other, more interesting vision is of machines that have something like human cognition. They will be our intellectual partners in solving some of the great medical, technical, and scientific problems confronting humanity. And their thinking may share some of the fantastic and maddening beauty, unpredictability, irrationality, intuition, obsessiveness, and creative ferment of our own. In the special issue of IEEE Spectrum, June 2017, the editors consider the advent of neuromorphic computing and its prospects for ushering in a new age of truly intelligent machines. It is already a sprawling enterprise, being propelled in part by massive research initiatives in the United States and Europe aimed at plumbing the workings of the human brain. Parallel engineering efforts are now applying some of that knowledge to the creation of software and specialized hardware that “learn”—that is, get more adept—by repeated exposure to computational challenges. Glenn Zorpette. Can We Copy the Brain. IEEE Spectrum. 2017 June. Zhu, Zhenghan. University of Rhode Island （2017）"Some Contributions to Radar Detection Theory"
Kaewtip, Kantapon. University of California, Los Angeles（2017）"Robust Automatic Recognition of Birdsongs and Human Speech: a Template-Based Approach"
Hossein Bashashati, University of British Columbia (2017) "A User-Customized Self-Paced Brain Computer Interface"
Tralie, Christopher J.. Duke University(2017) "Geometric Multimedia Time Series"
Wisler, Alan. Arizona State University, (2017) "Graph-based Estimation of Information Divergence Functions"